An FSA outpost that was taken by the YPG fighters in Rojava, Syria. 2013. Supporters of the YPG fighters gather in a funeral. Rojava, Syria. 2013. 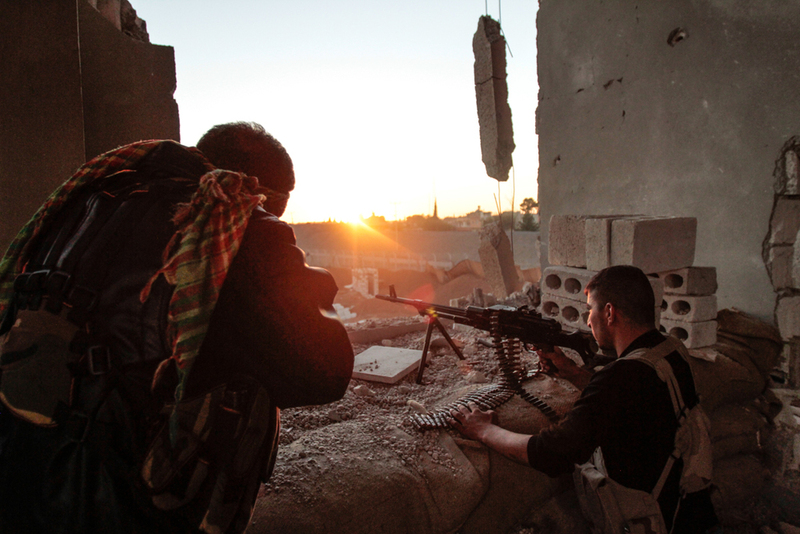 YPG fighters take position in the frontline of Ras-Alayn, a position that was taken from FSA forces. Rojava. 2013. A YPG fighter guards the funeral of fighters. Rojava, Syria. 2013. YPG fighter walks in the frontline near the Turkish border. Rojava, Syria. 2013. Children stand in their home that was attacked by IS militias. Rojava, Syria. 2013. A child holds the picture of a YPJ fighter that died during clashes with Islamist rebel faction. Rojava, Syria. 2013. The funeral of YPG and YPJ fighters. Rojava, Syria. 2013. Children attend to the funeral of a YPG fighter in Rojava, Syria. 2103. Syrian refugees wait for the Semalka crossing to open, so they can cross to Iraqi Kurdistan. Rojava, Syria. 2013. Syrian refugees from across the country, cross by river to Iraqi Kurdistan to seek for refuge. Syria. 2013. Villagers stand near their houses that were attacked by IS militias. Rojava. 2014. A man walks to the Semalka crossing. Rojava, Syria. 2013. Some YPG soldiers try to stop A group of more tan 150 Syrians looking for refugee in Iraq Kurdistan, attempted to cross the border without the Iraq Kurdish authorities authorization. The border has been closed since the last days of May, allowing only humanitarian aid. The only Syrians allowed to enter the Iraq Kurdistan, are chronically disease or with high level of medical needs, they also need a previous authorization from the Iraq Kurdish authorities. After an hour of sitting in the bridge of the border they were forced out back into Syria. Rojava, Syria. 2013. Iraqi Kurdish forces stops a group of refugees trying cross the Semalka crossing to Iraq. Rojava, Syria. 2013. A group of more tan 150 Syrians looking for refugee in Iraq Kurdistan, attempted to cross the border without the Iraq Kurdish authorities authorization. The border has been closed since the last days of May, allowing only humanitarian aid. The only Syrians allowed to enter the Iraq Kurdistan, are chronically disease or with high level of medical needs, they also need a previous authorization from the Iraq Kurdish authorities. After an hour of sitting in the bridge of the border they were forced out back into Syria. Rojava, Syria. 2013. A school serves as a transition place for refugees trying to fllee Syria through the Semalka crossing. Rojava, Syria. 2013.